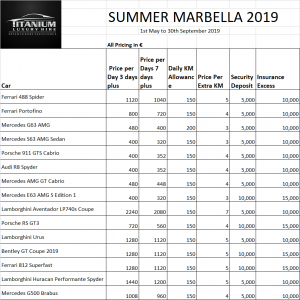 Titanium Luxury Hire, one of the leading luxury car hire services in Marbella and across all of Spain, has announced its list of Summer 2019 automobiles available for hire on the Costa del Sol. 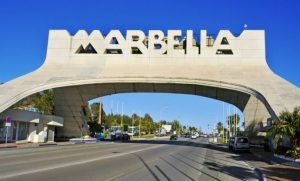 A Marbella summer is famous for its deluxe lifestyle where residents and visitors alike spend weekends visiting their favourite beach clubs, dining al fresco in the evening and generally enjoying the best that that Costa del Sol has to offer. Driving a prestigious vehicle from one end of the coast to the other is another highlight of the summer season, which is why Titanium Luxury Hire is unveiling its selection of motors for summer, which will be available from 1st May. Below is a complete price list for these fantastic cars, including the savings you can make if you hire them for a longer period of time. It is anticipated that this will be a busy summer in Marbella, and Titanium Luxury Hire urges you to reserve a car for your visit to Marbella well in advance of your trip. Also, if the car you desperately want to hire isn’t in the above Marbella Summer 2019 fleet list – please don’t hesitate to CONTACT Titanium Luxury Hire, and we will do our best to source the model you require. Titanium would also like to point out that it has luxury SUVs for hire, as well as executive cars, if these model types suit your needs better than a supercar.